Can love bring an end to the brutal war that has raged for so long, or will it spark the fighting around them into an all-consuming fire? The war's over but danger still lurks. As the packs align, hidden currents are about to cast a shadow over the peace. Charming, handsome, and with a smile on the edge of sin, Nico has loved Olivia from afar for what seems like forever. When Olivia is kidnapped, he not only finds himself alone with her, but standing between her and an angry wolf out for revenge. Olivia learns how Nico feels that day, he just hopes he's not left it too late. Olivia planned for her life to change when she left school—but she never bargained on Nico. He is the wolf who could so easily shatter her carefully constructed plans, ones she set in place to escape her father. It’s time she stepped out from the shadows. It’s time she became brave. It was tempting to lie back down and not move, to allow the snow to numb her body to the point beyond pain. A trickle of wetness rolled down her face. Katalina so desperately wanted to be home, in her family’s front room, watching TV. The fire roaring, its crackle and hiss the homiest of sounds. Only Katalina could never have that again. She’d never have the chance to enjoy another Sunday family dinner, or listen to her parents’ playful banter. She buried her head in her hands, tears dripping through her fingers and freezing on the snow. Arne whined, trying to comfort her with a lick and nudge. There was a rustle up ahead, further into the woods. Katalina lifted her head, squinting into the gloom of the trees. She scanned the area for movement. Arne growled low, the slightest of rumbles vibrating up his chest. Slowly, she climbed to her feet, her eyes never leaving the woods. “What is it, boy?” He positioned himself in front of her. “Show yourself!” she called, taking a few steps into the trees. The wolf stalked from its hiding spot, eyes wary, hackles raised, its dark fur startling against the white snow. “You,” she whispered, recognizing it as the dark wolf she’d felt drawn to in the shed. Arne barked louder, jumping forward. “No boy, come here!” she commanded, stopping Arne in his tracks. The wolf studied her for what seemed like forever. Katalina couldn’t stand the silence anymore. “Are you a shifter, too?” she asked. “You’ve lost it, Kat, talking to a wolf,” she muttered to herself. Before her eyes, the wolf morphed into a naked boy. “Yes, I’m a shifter, but not from your pack.” His voice vibrated through the air, low and brassy, pleasing to her senses. “So you’re here to kill me then?” she asked, surprised at her calmness. “I should be, but for some reason, I seem unable,” he answered, his voice void of emotion. “I imagine it is,” he stated. His face remained stoic. Katalina burst out laughing. Is this guy serious? “What’s so funny?” he asked, genuinely curious. “You know my name,” she said, shocked. Everyone knows my name. Silence fell between them. He stared at her as intently as he had when he was in wolf form. She found herself taking an unsteady step, an invisible force drawing her to him. “I’m f—” Her leg crumpled. She braced for the cold snow, but he’d crossed the space between them in a blur of movement, catching her inches before impact. Stunned, she stared openmouthed as he set her on her feet. This close she noted every detail. His hair was just long enough to tangle her fingers into, and the urge to do so was a potent thing. His bare chest was a solid muscled wall, and her fingers flexed where they rested, trailing through a smattering of dark hairs. “Why haven’t you healed yet?” he asked, oblivious to her wandering thoughts. He leaned forward, breathing deeply at the curve of her neck. “Did you seriously just sniff me?” she asked, shocked at the strangeness of the past twenty-four hours. “Shifters are strange,” she muttered to herself. “So I’ve been told,” she grumbled, still hardly believing it herself. He frowned. “Is that not home?” He gestured in the direction of the old farmhouse from which she’d escaped. Katalina sucked in a deep breath, lifting her eyes from the ground to meet his. “What better reason is there to cry?” Her cheeks heated as she realized she’d ranted to a complete stranger and told him things she maybe shouldn’t have. “What? Really?” She hadn’t expected that answer. She’d expected him to run for the hills after all she’d said. “You are very frustrating,” she laughed, surprised she still had it in her to. Around him, things seemed a little better. Her reaction to him was confusing, and Katalina added it to her mental list of things that didn’t make sense. Shaking her head, Katalina wrapped her arms around herself, trying to get warm. “You are cold,” he stated. “Right, time for you to go back.” He scooped her into his arms. He laughed at her. It rumbled in his chest and did funny things to her heart. “I’m not sure I want to be a wolf,” Katalina whispered, looking away from his face. “Oh, okay,” she hesitated, not wanting him to leave. He put her down and ran off. “Wait!” she called to his distant figure. “Bass Evernight,” she whispered, liking the sound of his name. “See you soon, Katalina Winter.” His promise wrapped around her, like silk against skin. She held it close to her heart, wondering when they’d next meet. 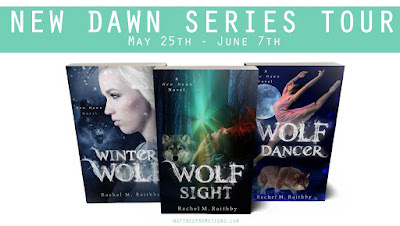 Rachel M. Raithby started her writing career in 2013 and hasn’t looked back. She draws her inspiration from the many places she has lived and travelled, as well as from her love of the paranormal and thriller movies. She can often be found hiding out with a good book or writing more fast-paced and thrilling stories where love always conquers all. She now lives in rural England with her young family.